Latest Recruitment in Nainital Bank 2017-18: The Nainital Bank Limited has issued the Nainital Bank Recruitment 2017 Notification recently. Interested candidates can refer the Nainital Bank Limited MT NOtification 2017 for eligibility. Eligible aspirants can apply online for the Bank of Nainital Recruitment 2017 @ nainitalbank.co.in. 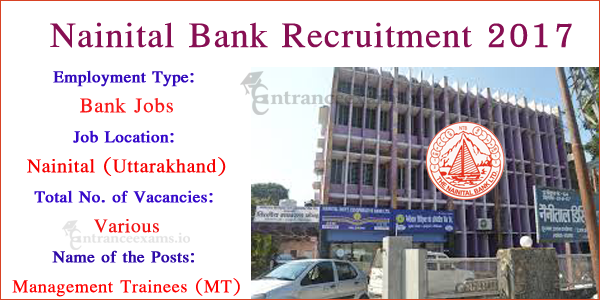 Know more about the Nainital Bank MT Recruitment 2017 Vacancy from the below sections. The Good Time has arrived for the aspirants who are in search of the Bank Jobs. Because the Bank of Nainital has offered the excellent chance for the job seeking candidates by releasing the Nainital Bank Notification 2017. As per this notification, the bank is going to recruit talented and eligible candidates for filling various Management Trainee (MT) Vacancies. So, interested and willing contenders who want to start their career in the Banking Sector can apply online for Nainital Bank Recruitment 2017-18. Aspirants have to make sure their eligibility for the Nainital Bank MT Vacancy 2017 before applying. Contenders who finished Graduation from the recognized university are eligible for the Bank of Nainital Recruitment 2017. Moreover, the candidate’s age should be between 21 and 27 years. Our entranceexams.io team have posted all the other details in the below sections. So, go through this article for getting complete awareness of the Nainital Bank Management Trainee Jobs 2017 information. Aspirants who interested to apply for the Nainital Bank Recruitment 2017 should satisfy the following eligibility conditions. Candidates who possess Bachelor Degree, BCA, BE/B.Tech, PG Degree, MBA or equivalent from a recognized Board are eligible. Postulants have to refer the Nainital Bank Limited Notification 2017 for the upper age relaxation details. The contenders who applied for the Nainital Bank Job Openings 2017 will be hired on the basis of their performance in the following rounds. The application fee for the Management Trainee Online Exam is Rs. 850/- plus GST @ 18% i.e., Rs.153/-. So, the total fee is Rs.1003/- for all categories. Firstly, visit the official website i.e., www.nainitalbank.co.in. Go to Recruitment/Results tab available on the left side of the homepage. Refer the Nainital Bank Management Trainee Notification 2017. If you satisfy the eligibility, click on the “Apply Online” tab. Fill the MT online application form with the required details. Cross check the details once before you submit the online form. Finally, take the hard copy of the Nainital Bank MT Online Application 2017 for further reference. Starting date to apply online: 23rd August 2017. Closing date to submit online application: 12th September 2017. This is all about Nainital Bank Management Trainee Recruitment 2017. If you found this article helps you, please share the information with your friends. For any doubts, you can ask us through the comments. Our entranceexams.io team will try our best in clarifying the doubts. Stay tuned to our site for the latest updates and Upcoming Govt Jobs.